SSP Founder Retires as Abbot of Tashi Lhunpo Monastery. Leave a congratulation post for Rinpoche, just click the comment button above. NOTE: If you’re interested in coming to Rinpoche’s retirement celebration, the details are at the bottom. to the February enthronement of the new Tashi Lhunpo Monastery abbot, SSP Executive Director Aviva Shaw caught up with Rinpoche and got his thoughts and feelings about going into retirement. Aviva Shaw: Rinpoche, how did you first become abbot? Khen Rinpoche: So it is a bit of story—I was asked, actually selected, two times. The first time, it was in 1996. You see, when my monastery needs a new abbot, the monks get together and elect few candidates for the high lamas to review. Then, the final appointment is made by His Holiness the Dalai Lama [HHDL]. He chose me just one year after we opened Siddhartha School. It was great honor, but it was going to be big difficulty for me because we had just started the project. Children were coming to our little school [in a rented room], and I had just accepted land given by villagers to build real campus. Aviva Shaw: So what did you do? HH The Dalia Lama and Khen Rinpoche at the 2005 abbot enthronement ceremony, Tashi Lhunpo. Khen Rinpoche: Well, when I met with His Holiness and he asked me, I told him I had just started a school for children back home in Ladakh. I told him that the school is very new, and I did not think it would stand on its own. I also told him that I don’t have the qualities, I am not ready yet, I need to learn these qualities to be a good abbot. I asked him if I could have more time, to become the abbot Tashi Lhunpo would deserve. And I made joke; [Rinpoche giggles] we have saying in Tibetan: “It takes 30 years to become good geshe, and 3 days to become donkey geshe.” I joked that I did not want to be a donkey abbot, but that with more time, I could be better one. His Holiness thought this was funny, and I think he saw I was really needed at the school right then. He told me that he would wait. He also joked, “The next time I ask you, please do not say no.” HHDL understood and then compassionately donated Rs. 5000/- to the school. 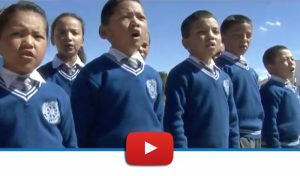 Take a moment to watch the “Khen Rinpoche Tribute” song by our children. This performance shows their appreciation for his many years of service. They know he worked tirelessly both as abbot and director of the school, giving all his time in earnest pursuit of helping others. Aviva Shaw: How many years have you been abbot? Khen Rinpoche: Fourteen years, 2005-1019. Aviva Shaw: You’ve done a lot for the monastery in those 14 years. What are you most proud of? 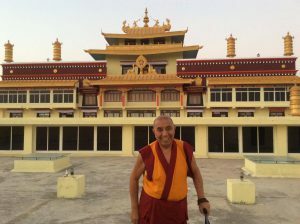 Khen Rinpoche: Well, thanks to many generous people, who really cared about helping us rebuild the monastery in India [the original Tashi Lhunpo monastery where Rinpoche studied as a boy was taken over by the Chinese government during the occupation of Tibet], we built the monastery’s main prayer hall—a beautiful temple, and the first freestanding library for a Tibetan Buddhist monastery in India. We are furnishing the new building now with books and computer. Those are very good things. And I am very happy to say, these last few years, Tashi Lhunpo has doubled the number of monks we graduate. The opportunity for monks to really focus on their studies—education at the monastery is much better. They are making commitment to really study hard. Since I’ve been there 24 monks have completed monastic college and gotten their geshe degrees. Tashi Lhunpo has preparations underway for Khen Rinpoche’s retirement celebration. Aviva Shaw: How has being abbot affected your work for Siddhartha School Project? Khen Rinpoche: In beginning, it was hard maybe to manage the school with my new position. But it was also very good for me and school, because being abbot is more recognition. 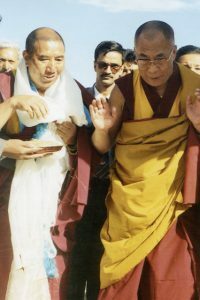 Being abbot helped me make connections and blessed me with many times to visit with HHDL and the great lamas working to rebuild our monasteries and carry on traditions and philosophy in India and the wider world. So, I think I was recognized by more people after became abbot and able to make more connections for school. I talk with more high lamas too. Having more time with Dalai Lama is so good for the school, and we are very happy to have had him visit the school three times, and to have our students meet him even more times than that. We were the first school in Ladakh to teach Buddhist philosophy, ethics, and debate—and His Holiness liked that. Our students would perform debates for him during his times in Ladakh for vacation. Then other schools started to do debate classes for their young people. This was a very good thing, to have more Ladakhi children learning style and methods of debate. Aviva Shaw: What do you plan to do in retirement? Khen Rinpoche at Tashi Lhunpo. Khen Rinpoche: Officially I retire on February 7th, and February 17th is the retirement party. So I’m having a big party. I will sponsor a whole day—the meals, the tea, and all activities for everyone to enjoy—for all the monks, my Ladakhi family, as well as Indian, American, and international friends who can make the journey. Yeah, I only wish I’d had more time to tell people and invite people properly, especially my friends from far away. It all got all settled very fast. HH the Dalai Lama and assembly of high lamas finalized their selection of the next khenpo (abbot) rather late, so there was little time to plan the necessary events for the many rituals and ceremonies the monastery will do. The plan to enthrone the new abbot, Zeekgyab Rinpoche, is on February 7th. Aviva Shaw: How are you feeling about retiring now? What are your goals for the next year? Khen Rinpoche: I am very tired because after I came out of 10-day retreat they needed me for all the rituals. This is third day of many rituals for me to officiate as we lead up to enthronement, and when these few days are done, the monastery holds chams [a ritual dance performance by the monks], so it is a lot of work, but important to do. For the future, I will spend my time in Ladakh during the summer season, while school is in session, and my winters in South India, where the climate is nice and warm. I will visit the Siddhartha children every day. They call me Mei-Mei ley [Granduncle], which is nice. I enjoy watching the children play and visiting their classes. It will be nice to spend more time at school and in supporting our principal. She is young, dedicated, and I like this about her a lot. Whenever I am there, we spend a lot time together talking about education and what we are doing to make the school the very best it can be for the children. She has the very good idea, how to care for children for inner education, of the heart, not only academics, education of the brain. This is most important. I’m also looking forward to having more time dedicated to prayer and meditation, as this is what I need to do, to prepare for the next life. Aviva Shaw: If you were to choose an emotion that you have about your retirement, what would that be? Khen Rinpoche: Happy. I had a lot responsibility at Tashi Lhunpo, and now I will relax, focus on my prayers and meditation, enjoy the school and my family too. Celebration Details: There will be a formal party at Tashi Lhunpo Monastery, and all are welcome to attend. You will need an Indian visa, but you will not need a Protected Area Permit (PAP). Specially reserved accommodations have been set aside for SSP’s international friends. We hope you can make it to South India for this beautiful event and celebration of Khen Rinpoche’s abbotship. 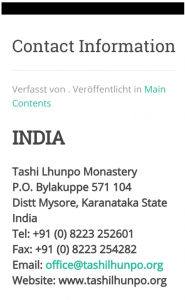 Please use the contact information pictured and request to speak with Mr. Tashi Tenpa, Tashi Lhunpo’s secretary, about reserving your accommodations and event pass. We completely understand if you cannot make it to the retirement party. Rinpoche would still love to hear from you. We encourage supporters to write a comment on the blog post and take a video or photo with your heartfelt congratulations and best wishes for Rinpoche in his retirement. Congratulations Rinpoche!! We are happy and excited for you in your next step after retirement. I wish I could be there with my whole family. Wishing you much joy, love and compassion in this next phase of your life, I’m sure you will prosper with whatever you do!! Congratulations! Thank-you for all of your teachings especially about the Bunny in the Moon. As a teacher, I continue to be inspired by your example of sacrifice and dedication to the children and your students. Your humble and generous gift of your knowledge, especially to those of us saturated in the superfluous obscuration of our own nature infused in the western world. Your kindness, acceptance and patience has been a great spiritual bridge. Enjoy your next phase in your triumphant journey for the sake of others. Blessed be , thank-you and congratulations! Lotus Do, The Dalton School. Congratulations on retirement and on the many accomplishments at Tashi Lhunpo! I hope you enjoy the wonderful celebration party! Wishing you many happy summers in Ladakh with the SSP children and your family – as well as best wishes for your time of practice. I think of you often with love, appreciation and good wishes! 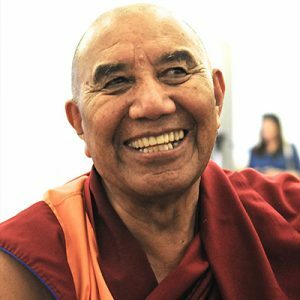 Dear Rinpoche — Julley! So wonderful that you are finally going to retire! All prayers of love, health, long-long-long life and auspicious circumstances for your practice and your time with family and Siddhartha School friends. With much love and appreciation for you always, my dear Teacher! Hearties congratulations 🙂 wish you a very good health ahead. Feeling already honoured and blessed to be a part of retirement celebration. See you soon memelay. Very very excited! Thank you for the love and compassion that you spread. Congratulations on your retirement!! I wish I could have been there with my family to celebrate with you! Wishing you a blessed long life and hoping to see you again soon.